"A Darkness all of Light"
(DAY 2) SUNDAY APRIL 7TH - 9:30 AM - 5:00 PM. Monastery Contemplative Day of Retreat on Sunday, April 7th, presented by Father Martin Laird, here at the Monastery of the Holy Spirit. The retreat is geared toward the mid-level practitioner of prayer. 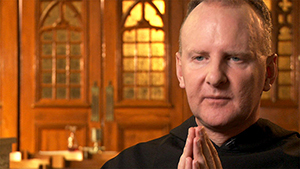 Father Laird plans to present a full intensive day of Contemplative Retreat from 9:30 AM to 5:00 PM. It includes two conferences interspersed with Prayer, Silence and Community Sharing. Follow the below links to read more about the presenter, retreat's schedule, guidelines, and detailed description. Then proceed to register. This is a small gathering with limited seating. Note: This retreat is a repeat of the one presented the day before on Saturday, April 6th “Day 1”. Because of the demand we added this date. Offering $75.00 and includes refreshments and lunch. See further details and registration.